The original Christ Church was erected on the north side of Lombard Street in 1836-7. The architect was W. A. Nicholson of Lincoln. 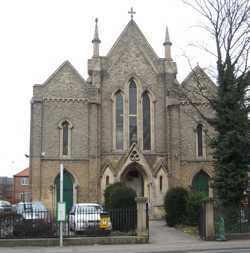 It is built of stock brick and stone in Early English style, and consists of a chancel and nave with three gables and groups of three lancets at each end. There is a tall lancet arch to the straight-ended chancel. Inside there are galleries on cast iron columns. The church was restored and a new organ installed in 1880. A new Christ Church was build on Boundary Road, Newark, in 1958. Old Christ Church was declared redundant in 1962 and sold for use as commercial premises. Particular thanks to Jessica Key and Andy Nicholson for research on this entry.